Possibly the largest electronics manufacturer in the world, Foxconn plans to add a half million robots to its assembly lines. How to deal with the rising cost of running your factory? Get rid of all those inefficient humans and hire robots instead. Citing labor shortage and rising wages Hon Hai, the world’s largest contract electronics manufacturer, recently announced that it intends to build a robot-making factory and replace 500,000 workers with robots over the next three years. Supervisors will never have to hear about bathroom breaks again. Hon Hai, parent company of manufacturing giant Foxconn, which assembles the iPhone and iPad for Apple as well as products for Sony and Nokia. Hon Hai already has 10,000 robots busy at work in its factories, and they’re not wasting any time with their plan to increase the number of robots to one million by 2013. Earlier this month the company announced their plans to build a $3.3 billion “intelligent” technology park in Taichung, Taiwan. That intelligence will come from CNC (computerized numerically controlled) devices, servo drivers and motors, and robots. Part of the driving force behind the company’s robotization is China’s booming economy. With about 800,000 employees and a yearly revenue of about $60 billion, Foxconn may be largest electronics maker. The company has made its name largely on cheap national labor. But as China’s economic growth has led to increases in worker wages and, at the same time, increased demand for the electronics that Hon Hai makes. Hon Hai’s company chairman Terry Gou, among China’s richest men, spoke at a ceremony where he signed a letter of intent to invest $3.3 billion in greater Taichung. He said the robots will increase the production value of Foxconn by about $4 billion over the next three to five years and create about 2,000 new jobs. Rumors in the past had pointed to FRIDA as Foxconn’s robot of choice, made by the Swiss robotics company ABB. But evidently Foxconn isn’t going to wait around for the robots to come to them. And considering the sheer number of robots they plan on building and putting in their factories, it makes more sense for the company to custom-design and build themselves. The program’s initial cost is estimated to be about $223 million, but it should pay off in the long run. After a spate of jumping suicides, Foxconn began setting up nets like these. Foxconn is long due for some positive change. A string of suicides at several Foxconn campuses have drawn international scrutiny and criticism. The companies factories are models of efficiency, with a production line scheme designed in such a way that “no worker will rest even one second,” Li Quang, executive director of the labor rights group China Labor Watch, told the New York Times. Between March and May of 2010 nine Foxconn employees leapt to their deaths from Foxconn factory rooftops. 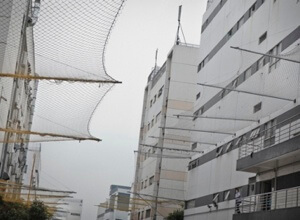 Foxconn responded by installing catch nets around their high-risk buildings. Over the past 15 months 14 Foxconn workers have died in what looks to be suicides. Of course, installing half a million robots will most likely lead to much of Foxconn’s workforce looking for other jobs. But the company insists its intention is not to replace humans, but to move humans from jobs that are “dangerous and monotonous” and free them up to do jobs that take more thoughtful research and development. I’ll believe that when I see it. If his workers might not be, Gou is certainly excited about his company’s coming robot revolution. “The investment marks the beginning of Hon Hai’s bid to build an empire of robots,” read a statement from the Central Taiwan Science Park authorities. At the ceremony, Gou declared that Hon Hai will build an “intelligent robotics kingdom” in the coming years. “Empire of robots”…”robotics kingdom”…I wonder if Mr. Gou has some bigger plans for his army of robots. Sorry, probably a bad choice of words. When the robots roll out onto the factor floor, they’ll join the warehouse floor-scooting Kiva and other robots that are revolutionizing industry automation. Pretty soon it’s going be strange to see a human on a factory floor. But at least they’ll still need humans to do the more intelligent and creative decision-making jobs. You know, the kind that Watson is studying for right now.